Nick Chubb: Can He Break Out in a Crowded Backfield? With the NFL Draft and free agency having come and gone, we’ll break down all sorts of fantasy-relevant questions entering the 2018 season. Here we’ll look at whether or not the Cleveland Browns’ second-round pick out of Georgia can emerge in a crowded backfield in Year 1. The Browns got a great season out of pass-catching back Duke Johnson, let early-down grinder Isaiah Crowell walk, and brought in Carlos Hyde to replace Crowell — everything made sense in Cleveland for a few weeks. Then they took Nick Chubb with the 35th overall pick of the NFL Draft. Why should we care about Chubb in the first place, and how should we approach him in fantasy? Chubb was a dominant back at Georgia, carving up SEC defenses to the tune of 1,547 yards and 14 touchdowns to go along with 213 receiving yards as a true freshman. Just as he appeared to be on the fast track for a Heisman-hoisting sophomore campaign, he tore his MCL, PCL, and LCL, ending his season. He came back to a committee with Sony Michel and never hit his freshman mark of 7.1 yards per carry, though he did receive more carries that year. Chubb’s injury may have cost him a step, but based on his usage, the Georgia coaching staff was confident he could still handle a heavy workload. Chubb’s college workload is admirable, but if Cleveland doesn’t use him similarly it doesn’t really matter. And unfortunately for Chubb, second-round picks generally don’t see tremendous workloads, averaging 10.6 carries per game and 2.5 targets per game in the past decade. Using our NFL Trends Tool, we see that players who average 8.6-12.6 carries and 1.5-3.5 targets produce 10.30 DraftKings points per game, which would’ve been good enough for a finish just outside the top 24 running backs last year. However, second round backs have averaged just 12.6 games played in their rookie season, and many of them entered the league in significantly better situations than Chubb will. Chubb joins a Browns backfield that’s deep with players who have proven to be capable of handling large workloads. Hyde carried the ball a career-high 240 times last season and Johnson saw a career-high 93 targets that he converted to 74 receptions. Both players were signed to three-year deals worth north of $15 million this offseason. The Browns have won one game in their past 32 outings. Playing on a team that Vegas has pegged to continue a legacy of losing (their win total is set at a league-low 5.5) could make scoring fantasy points difficult for their early-down backs; a low win total implies run-unfriendly negative game scripts. Add this on top of Chubb’s competition and he looks like a low-volume early-down back on an offense that will need to pass a lot — not exactly a guy you want to bet on to score a ton of fantasy points. Chubb is a supremely talented player and the Browns know this. He will out-touch Hyde and Johnson at some point. Whether or not that is this year, we don’t know (our experts have him ranked outside the top 50 running backs in PPR). 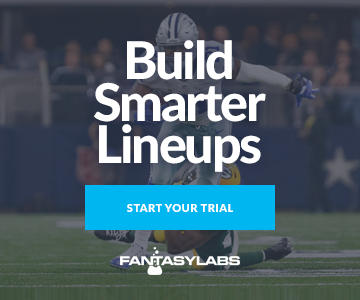 Let someone else overdraft him based on his stellar college resume look out for him on the waiver wire when he’s failed to make an impact early in the season — or use our Lineup Builder get him in DFS lineups once his touches start increasing. The Browns backfield will be spread too thin for any one back to get a large amount of touches, and negative game script could potentially hold back even a bell cow in this offense. I’ll fade a low-volume rusher on a team that Vegas thinks will be losing more often than not all day.